Vijaya Bank, was founded by late Shri A.B.Shetty and other enterprising farmers in karnataka in 1931. The main objective of the founders was to promote banking habit and enterpreneurship among the farming community of Dakshina Kannada district in Karnataka State. The bank became a scheduled bank in 1958. The bank steadily grew into a large All India bank. In 1963-68, nine smaller banks merging with it. The credit for this merger and growth goes to late Shri M.Sunder Ram Shetty, who was then the CEO of the bank. The bank was nationalised in 1980. The bank has built a network of 1300 branches, 864 centers, 48 Extention Counters and 750 ATMs as on March 2012, that span all 28 states and 4 union territories in the country. Below given are the various job openings in Vijaya bank. This space is dedicated for notifications of Vijaya Bank Recruitment for the year 2013. 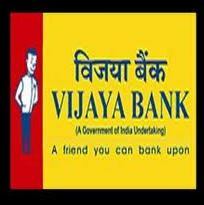 This post contains notifications about vijaya bank probationary assistant manager recruitment 2013, vijaya bank probationary officers recruitment 2013, vijaya bank clerk recruitment 2013, vijaya bank clerk recruitment 2013 through IBPS etc.